Namibia is home to vast deserts, and sweeping oceans. It’s a place travellers can visit to get a glimpse of ancient history, modern cities, incredible wildlife, and friendly locals. If you’re looking to explore this gorgeous country (and you should be! 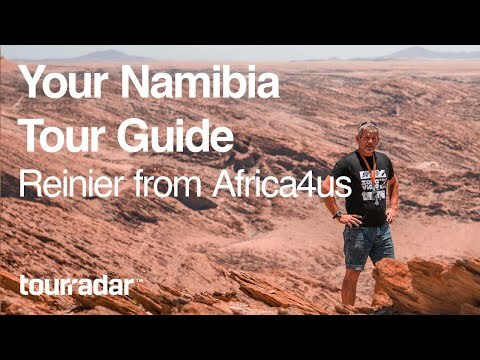 ), then you’re in luck – today, TourRadar and Africa4us have joined forces to introduce you to Reineir, a tour guide who spends his days exploring Namibia’s great outdoors. Join us as Reineir talks nature, travelling, and his job. Reineir, who was born and raised in Capetown, South Africa, has been leading overland tours for the past six years, and the number one thing he wants travellers new to Africa to realise is that Africa is a safe, adventurous, and fun destination! According to Reineir, the most dangerous part of visiting Africa is the fact that you’ll want to keep coming back! Africa4us travels to eleven countries, and the most challenging part of Reineir’s job is to make sure travellers get the most accurate information possible from him. Thankfully, he loves doing his research to find the best, most interesting, and factual information for travellers who are packed full of questions about the new places they’re visiting. So what makes a successful tour? According to Reineir, it’s communication! If you’re unhappy during a tour, the most important thing is to let your tour leader know what you’re expecting from the tour and what they can do to improve your experience. If you wait until you’ve gone home to complain about your tour, that’s not going to make that tour any better! Reineir thinks it’s always possible to improve a tour experience for someone if they speak up about what’s not working for them. Overlanding can be a rough experience, but even the most diverse groups of people can get along on tour! With breathtaking views, brushes with animals you’ve only ever read about, and local experiences you can’t have anywhere else, Africa – and Namibia – are the perfect location for your next adventure, no matter what kind of experience you’d like to have. If you’re interested in touring with Reineir and Africa4us, head over to TourRadar to find your perfect tour today!